These thoughts all came back to me the other day when I finally had time to reflect on this week’s POTSC’s “Never Beyond” Poster. Why do we get so emotionally invested in the process of grace for fictional characters and yet, tend to withhold grace to the REAL LIFE people who need it, right here and now, in our lives? From the moment God created Man, He placed in us this incessant need for justice. God’s character demands justice and because we were created in the image of God, so do we. Then God said, “Let us make human beings in our image, to be like us. When we are wronged we have this need to see justice done. Don’t get me wrong, our need for justice isn’t always a bad thing. Some of the people I admire most in their faith are pioneering a new way in taking up the causes of the hurting and oppressed in this world. It’s God’s need for justice that drives this need in us. But sometimes, our need for justice in a fallen world, in the heart of a fallen man or woman, breeds a desire for revenge. This is how much God loved the world: He gave his Son, his one and only Son. And this is why: so that no one need be destroyed; by believing in him, anyone can have a whole and lasting life. That’s second chance talk at it’s best. That’s PEOPLE OF THE SECOND CHANCE. 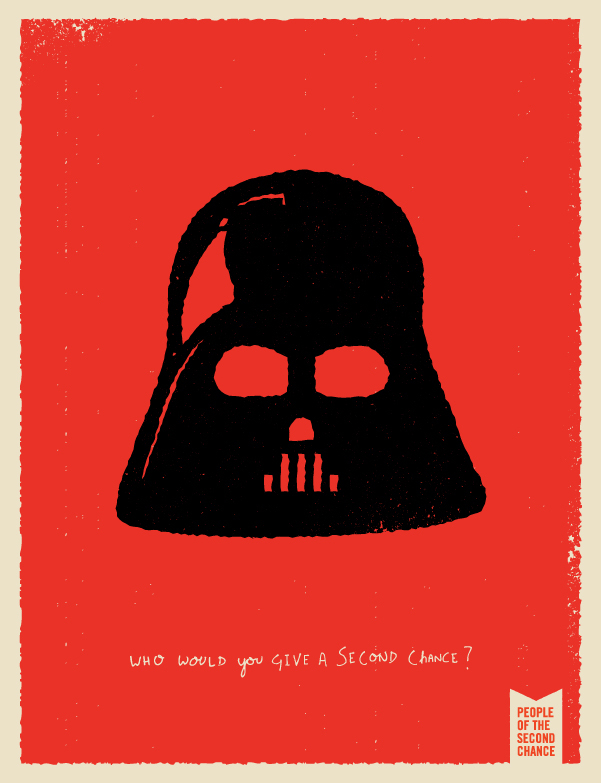 Characters like Darth Vader beg our hearts for grace, for compassion, for a second chance. The question for us is can we move beyond our selfish need for revenge to our God DNA of GRACE. Can we extend the second chance to the real life villains in our real world? Grace puts “the world right again” and that is God’s idea of second chance justice. Excellent post, Jason! I just happened to read it as I was thinking about what to say to lead into a song set on September 11th. This definitely shed some different light on what might come out of my mouth that morning. Thanks a million! Thanks Z! I miss you guys! i love that even as a kid, your heart was cheering for Darth Vader to have a second chance… to be redeemed… to come back to the good side. that says so much about you, and what you value. but you’re right — it’s much easier for me to rally around fictitious characters in need of grace than the real flesh-and-blood ones that i encounter in my everyday life. such a needed wake-up call for my heart. Thanks, A 🙂 I really appreciate your thoughts. It’s true. And like Alece said, it’s a lot easier to cheer for and excuse fictional people rather than people you know in real life. Why if that? Is it because in fiction you know how it’s going to play out, they good will prevail, whereas in real life, evil will run ramped? Maybe it’s because in real life it’s happening to US not the people in the story. When it’s US personally, it’s different. But should it be? I don’t think so. We, as Christians, are called to forgive. Excellent thoughts Jason, we are so often hung up on ourselves that we can’t see past the surface to show God’s love and grace to the hurting around us.